Got a great idea for a book for children but don't know where to start? Take the pain out of the process. Karen Lynn Williams and Catherine Stock are planning a two week children's book workshop in Rignac, France. Join us in a beautiful spot to develop your ideas and have a great time doing so. 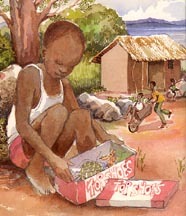 Karen and Catherine have collaborated on several books together in the past, including their award winning and best selling picture book, Galimoto. The two women have taught book writing and design and illustration independently, Karen in workshops, and Catherine at the University of Cape Town. 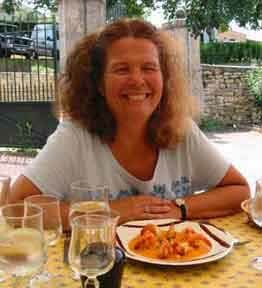 Catherine has also been holding drawing and watercolor workshops in southwest France since 2000. Karen will work with words, text, concept and development. Check out her website: www.karenlynnwilliams.com. Catherine will talk about design, layout and illustration. This course is designed for the beginning writer as well as for the student with a writing background. Learn how to get started, how to revise and how to polish your writing as well as where and how to market your manuscript. Each student will have individual instruction time with Karen as well as class discussion and workshops and free writing time. Catherine worked for many years as the art director of children's books at the prestigious publishers: Putnam, Clarion and Atheneum. 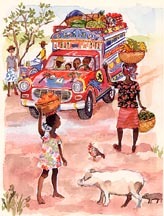 She taught writing, design and illustrating children's picture books for two years at the University of Cape Town. Several of her students have subsequently gone on to illustrious careers as authors and artists. A selection of housing will be offered, or depending on how quickly people sign up, a large private gite will be rented for students. 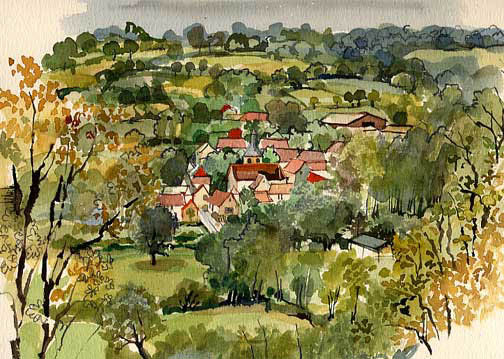 Click here to see more information about my home, the village of Rignac and the Lot, or Quercy as this part of France used to be known. There are possibilities of repeating the course in Provence, Vermont, and Maui in the next few years. * Allocate a writing hour for every single day. * Write whatever holds your interest or takes your fancy. * If you can't think of anything to write, write anyway. * Work for no other reason than to give yourself joy. * Bring in the wisdom of all your fallow or waste. * In your spare time read the admired writing of others. * Share your efforts only with a trusted friend. * Look for the gleams of personal style and go there. * When you think you're getting it right, rewrite it. * Allow yourself to fall in love with the process. * Archive your work for your own benefit as you go. Give this program some honest effort for a six week period. Please feel free to email Karen or Catherine with any questions.